You move your old hosting account from other company to MyGreatName. You happen to delete the database in your hosting account. Your hosting account is damaged by accident. Restore the records of the tables. You must do a MySQL Database backup before you can Restore a MySQL Database Backup. 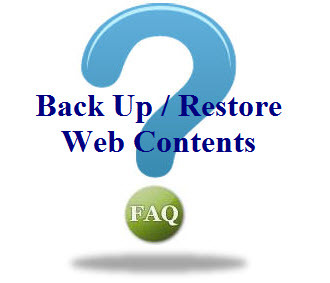 The Restore procedures are very simple. Select the Download/Upload backup file. Select the "Restore a MySQL Database Backup". Browse the backup file (in .gz format) in your computer. If you have more than one database, restore them one by one. If you have used scripts (e.g. PERL or PHP) in your website to connect to the database, you need to create user(s) and grant access to the user(s) as well. The Backup and Restore process CANNOT restore this setting. Click the link of MySQL Databases. Fill in the username and password under Create MySQL user. Click the "Create MySQL User" button. Select username and MySQL Database under Grant all permissions on a MySQL database to a MySQL user. Click the "Grant Permissions" button.